Going from one pose in Yoga to another. 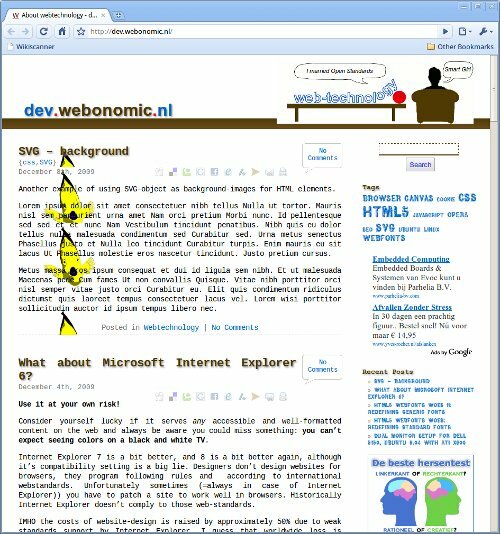 Here at Webonomic we always liked SVG. We experimented with SVG and SVG background quite a few times, also creating some fancy animated backgrounds and other animations at the times Apple hadn’t even released Safari or thought about CSS transforms, transitions, and animations. Unfortunately SVG has never been really embraced by the majority of browser vendors, only Opera was enthusiastic about it, probably because both Adobe (Flash) and Microsoft (Silverlight/ Vector Markup Language (VML) had their own standards and felt threatened by it. (Adobe doesn’t make browsers, but SVG support in their Creative Suits has never been impressive) Maybe that’s gonna change now with HTML5 and even Microsoft Explorer 9 support. Using SVG as images was one thing, using it as a background image was even better. And now we stumbled upon this clever trick showing layered SVG images by setting the hashtag to an ID on a g element and using the CSS :target rule. Simple and elegant. Works in Firefox and Opera at the moment. What about Chromium? Works in Firefox and … Well, only Firefox at the moment. Great that you can set the SVG-layer from the main document. But why can’t we set the fill or strike color? // I guess setting the URL is better then setting an extra ID or class, after all aren't URL's unique by definition. Then you can unleash the power of SVG sprites completely, and skin every site and web-app `on the go`! 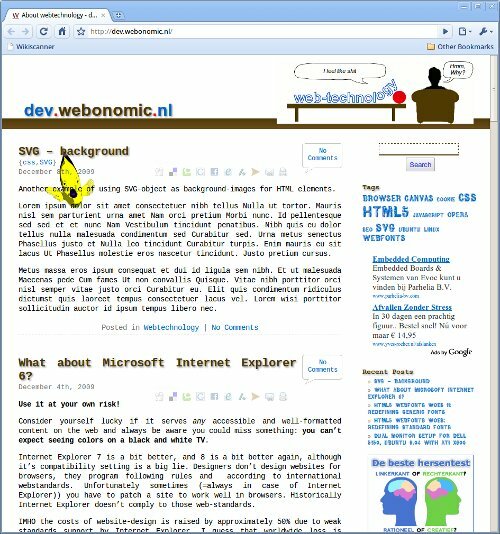 Will Microsoft add SVG support to Internet Explorer in the near future? Microsoft has applied to join the World Wide Web Consortium (W3C) Scalable Vector Graphics working group. I would say ten years to late, but they did it. So will all the examples on this site work in Explorer soon. I hope, but I fear not. Let’s explain that to you. One of the reasons I write critically about Microsoft is that they’re trying to slowdown internet innovation, probably best illustrated by the so called Embrace, extend and extinguish strategy, which had the purpose to extend open standards with proprietary capabilities, and then using those differences to disadvantage its competitors. Now Google (and to a lesser extent Apple) entered the browser-market, things are starting to change. At least the web is gonna change: sites do not longer contain information, they contain applications. And when you use web-applications, you don’t need them as a stand-alone program. That’s the danger for Microsoft. It’s not new, it has always been there and Microsoft knew. That’s why they made their browser `a critical part of their operating system`, technically nonsense, but they reached their goal. I took the EC a few years to refute that claim, a few years Microsoft made a lot of money. Why didn’t Microsoft embrace SVG earlier. Well they developed Vector Markup Language (VML) during the nineties. That didn’t became a standard, so I guess they decided to stop doing anything for 5 years. Now Microsoft gained some substantial marketshare with Silverlight, a Flash/SVG comparable technology, which it’s used a lot for streaming Media lately, they probably think let’s join the SVG working group to – these are my words – see if we can slowdown their activities. Will we see SVG support in Explorer 9. I bet not! I was totally wrong. There is SVG support in Explorer 9. I reduced colors in Gimp, saved as PNG, did a bit tracing in Inkscape with Potrace and here is the SVG Parrot from Amsterdam! Format is SVGZ, weight ca 60kb. Opera can show svg as IMG src, I dunno about other browers, but it would be nice if they can. It’s easy to upload and insert in a WordPress blog that way.